Debut Design – Be among the select few to share in this premiere design. 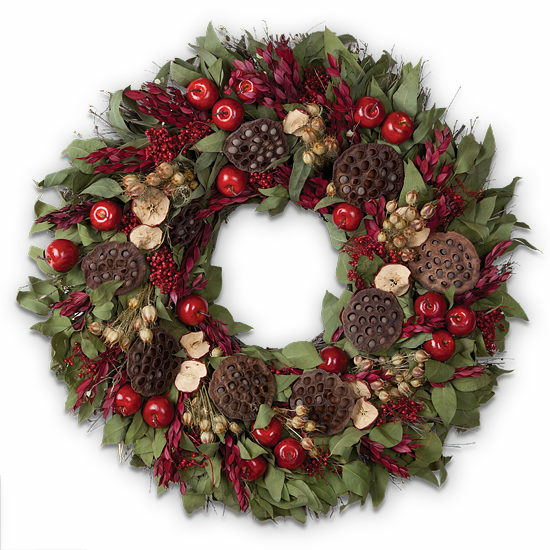 We don’t know anyone who wouldn’t be delighted to hang this majestic wreath. Our 30″ ensemble is fashioned on a natural twig base with rich red faux apples, naturally dried leaves and punctuated with preserved myrtle, pepper berries and nigella pods. Dried apple slices and lotus pods peek up here and there. It arrives ready to hang. To remove, simply snip straps from the back of the box and lift the item gently. Our preserved designs are originally produced with extra elements so slight shedding during transit is normal. The colors will soften naturally over time. The designs are best maintained when displayed indoors, away from direct sunlight, strong heat sources and extreme moisture. Please note: outdoor display is not recommended.